1. Use an electric mixer to blend together all the crepe ingredients except the butter for the pan in a large bowl. Blend just until smooth. The batter will be very thin. 2. Combine the filling ingredients in a medium bowl and mix by hand. Keep the filling nearby. 3. Preheat a 10-inch frying pan over medium heat. When the pan is hot, add about 1/2 teaspoon of butter. 4. When the butter has melted, pour 1/3 cup of batter into the pan. Swirl the batter so that it evenly coats the bottom of the pan. Cook for 1 1/2 to 2 minutes or until golden brown on one side. 5. Use a spatula to lift an edge of the crepe. 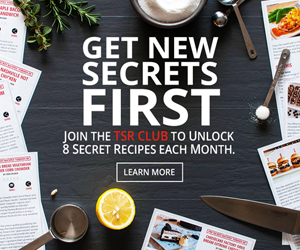 Grab it with your finger, slip the spatula underneath, and quickly flip it over. Cook for another 1 1/2 minutes or until a bit lighter shade of brown than the first side, the slide it out of the pan. Repeat with the rest of the batter and stack the finished crepes on top of each other to keep them warm. 6. Heat the cheese filling in the microwave for 1 to 2 minutes or until it is hot. 7. When ready to fill the crepes, place each crepe, dark side down, on a plate. Pour 2 to 3 tablespoons of cheese filling across the center of the crepe. Fold the sides in and turn the entire blintz over (to hide the seam) onto a serving plate. You can use a knife to cut off the rounded ends off the blintzes if you like. Repeat with the remaining blintzes. 8. 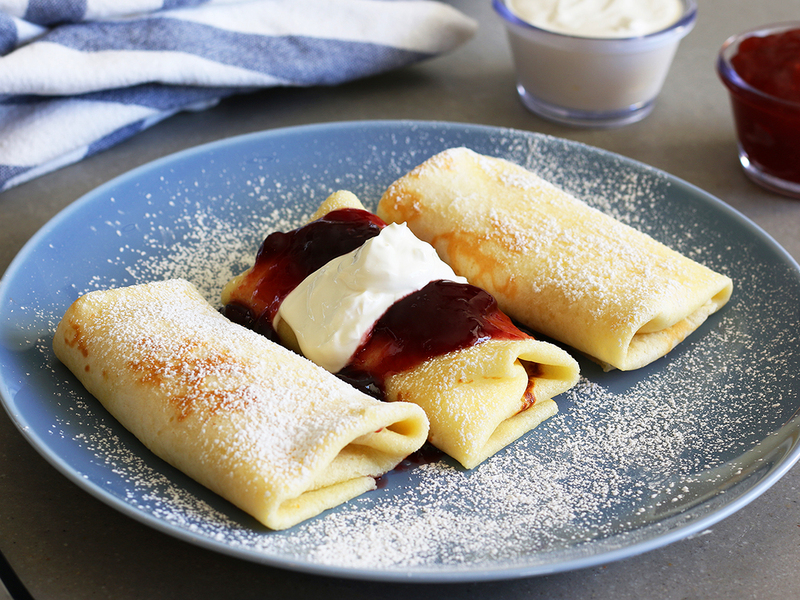 Serve 2 to 3 blintzes on a plate with a dollop of sour cream and 2 dollops of strawberry preserves carefully arranged on the plate next to the blintzes. Sprinkle the blintzes with powdered sugar. Tidbits: If you would like to make this recipe with a low-fat or non-fat filling, replace the cream cheese or farmer's cheese with strained yogurt —a yogurt solid that is thick like cheese. To make it, pour a cup of low-fat or non-fat yogurt into a coffee filter placed inside a strainer. Put that strainer over a bowl and into the refrigerator for 4 to 5 hours so that all of the liquid whey strains out of the yogurt. What you have left in the strainer is a thick, nutritious yogurt cheese that can be used in place of cream cheese or sour cream in this recipe and many others.